Snowy conditions and chilled temperatures don’t need to put the freeze on your event planning. The winter months can offer up unique events, attractions and opportunities – and there are few destinations where winter comes together like Calgary. There are benefits to being the former host of the 1988 Winter Olympics. Calgary’s WinSport at Canada Olympic Park boasts a scenic and exciting event space like no other. Here, guests can enjoy a host of outdoor activities such as skiing, snowboarding, bobsleigh rides, luging and skating. WinSport also caters to indoor events with stylish meeting spaces, cutting-edge presentations amenities and world-class dining. For breathtaking sights and outdoor adventure, it doesn’t get more memorable than Banff National Park. Located just a short drive from Calgary’s downtown, Banff is world-renowned for its winter thrills. Whether you’re planning a day on the slopes, sightseeing by Lake Louise, sleigh rides, snowshoeing, ice climbing or a cozy meal in the mountains, Banff provides the perfect backdrop for any event. Few cities embrace the cold like Calgary. Throughout the season, you’ll find plenty of festivals and celebrations across the city. Plan your itinerary around the Calgary Midwinter Bluesfest, Block Heater winter music festival, Big Taste Calgary, the Fort Calgary Winter Carnival and the famed Calgary Winterfest, featuring 11 days of live entertainment, sports competitions, culinary treats, arts and city-wide events. With many nightclubs and pubs, indoor entertainment venues and indoor pedestrian walkways, there are plenty of ways to enjoy the great indoors. Cheer on the Calgary Flames, catch a play or comedy act, enjoy an evening at the casino or close out the night at the Cowboy’s Dance Hall, Wildhorse Saloon and other unique western venues. The 17th Avenue Retail & Entertainment District also features over 400 unique shops and services (all with ample heating, of course). Calgary cuisine is perfect at any time of the year, but there’s something about enjoying a cut of Alberta beef while watching the snow that sets the perfect winter vibe. And with hundreds of award-winning restaurants helmed by top culinary pros, there are plenty of tastes and venues to discover. There are no shortages of accommodations that show off Calgary’s winter wonderland. Guest ranches and bed-and-breakfasts also complement the city’s portfolio of 13,000 guestrooms. So whether you’re looking for a place to kick up your heels, enjoy refreshments over the fire or conduct an informal get-together against the backdrop of the great outdoors, you’ll find plenty of options to enjoy the sights while keeping your guests cozy. 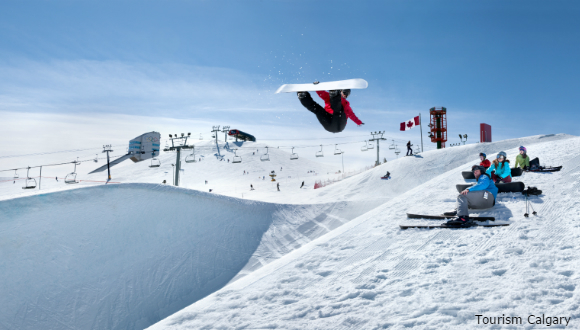 No matter your event plans, winter in and around Calgary is hot with exciting recreation and incentive travel opportunities. See why Calgary shines in the cold at www.meetingscalgary.com. This entry was posted in Industry Insights and tagged Alberta, Banff, beef, Calgary, entertainment, meals, tourism, tourist, WinSport, Winter.